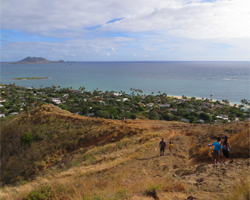 Lanikai Pillboxes Trail Offers a Spectacular 360-degree View of Windward Oahu. 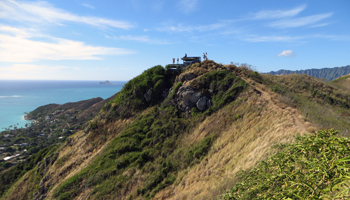 Lanikai Pillboxes: A Short & Spectacular Hawaii Hike! 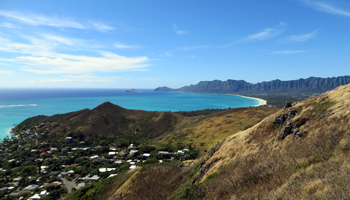 Many people will probably tell you the view from the top of the Lanikai Pillboxes trail is the most beautiful on Oahu. I disagree… but only barely. 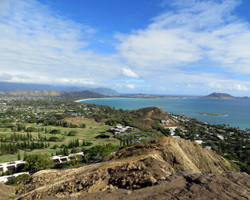 The view from atop Ka Iwi Ridge, which runs between the Lanikai and Enchanted Lake neighborhoods of Kailua, is simply breathtaking! Thus, it’s only by the smallest fraction of a percent that I can say I still think the view from Puu Maelieli is a little more magnificent – but that’s really a just matter of personal preference. The hike from trailhead to summit is only a half-mile (0.8 km) in length with an elevation gain of just slightly more than 500 feet (160 meters). That makes the Lanikai Pillboxes trail fairly short and steep; but the cost/benefit ratio of energy exerted to view received makes this little jaunt well worth the effort – especially if you’re there early in the morning when conditions are calm and clear! The first part of the trail is the steepest. As soon as you clear that stretch and make it up onto the ridge, the incline tends to be more gradual; and the views get better and better the higher you go. You’ll know you’ve reached the summit when you arrive at the ruins of two observation pillboxes. 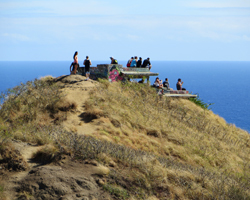 Although the trail does continue past the pillboxes along the Ka Iwi Ridge down into the Enchanted Lake neighborhood, most people turn around and go back down the way they came. Unless you’re a resident of the neighborhood, you should do the same. I grew up in Windward Oahu (the East side of the island), so I admit that I’m a little biased to the beauty of this area. But see it for yourself, and I think you’ll agree! It’s gorgeous! From the Lanikai pillboxes, you’ll see all the way from Chinaman's Hat in Kaneohe Bay across all of Kailua Bay, Lanikai Beach, the Mokulua Islands, and Waimanalo Beach out to Makapuu Point! Then turn around and see a sweeping vista of the majestic Koolau mountain range, Pali Lookout, Enchanted Lake, Mid-Pacific Country Club, and Bellows Air Force Base! To maximize your viewing experience, I would suggest that you go as early as possible in the morning on a brilliantly-clear day. If you get there in time for the sunrise, that’s even better. I had previously done this hike only in the late afternoon when Windward Oahu tends to get cloudy, the water conditions tend to get choppy, and the sunlight shines on the back of the hill rather than the water. I’m not saying this in unattractive, but it pales in comparison to the glory of a morning hike! I never realized exactly how spectacular this view is until I recently went just after sunrise! 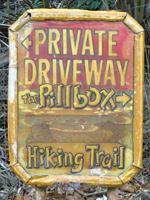 If you do go early, however, please remember that the trail head is located in a residential neighborhood; and the residents will appreciate your respect for their privacy if you slip by silently. 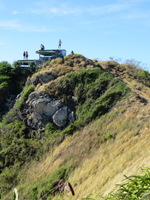 If you’re interested in Hawaii history, the pillboxes at the top of the ridge are also noteworthy Hawaii attractions. Constructed between World War I and World War II as part of the Oahu coastal defense system, these concrete bunkers were once used to track targets at sea and relay firing coordinates to the batteries at Kaneohe Bay. Disappointingly, however, the graffiti vandals have been busy showing their lack of regard for everybody else. It actually smelled of fresh paint during my most-recent visit. Nevertheless, the Lanikai pillboxes are still interesting as a visual reminder of how WWII came to the American shores only in Hawaii. This is not an official state park trail. This is a path created and used primarily by local residents. As a result, the trail is not maintained by the government (or by any other officially-designated group of which I’m aware). That means there are no railings or steps or parking or facilities. There’s a rope tied to some trees along the very beginning of the trail, and that’s it. 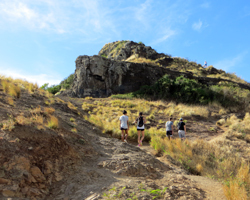 There are steep cliffs alongside the trail, loose rocks, slippery slopes, and runoff rutted footpaths. If you’re looking for a carefully controlled environment, this isn’t it. On the other hand, if you have a properly-functioning brain and a modicum of physical fitness, you should be fine. I saw everybody from young children and dogs to parents with infants and seasoned citizens – and not one of them seemed imperiled in any way. The parking situation is terrible. There’s room for approximately a half-dozen cars along the fence of the Mid-Pacific Country Club on Kaelepulu Drive. After those are taken, you’ll need to find parking along the other neighborhood streets, which can be tricky because of all the marked no-parking areas and one-way streets. Also keep in mind that this is a residential neighborhood. You don’t want to make the residents resent the hikers. The first part of this trail is red clay dirt. 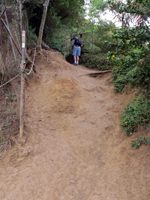 It’s steep enough that it’s somewhat challenging to climb when it’s dry. However, when this type of dirt gets wet, it can be as slippery as ice! I would strongly urge staying off of this trail during or after a rain. I doubt you’d slip off the cliff, but what’s the point in risking it!? Besides, there’s not going to be a view in the rain anyway. 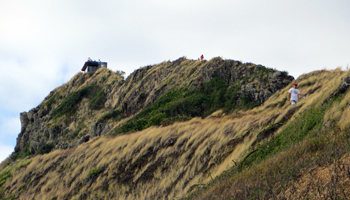 Approximately three weeks after I last hiked the Lanikai Pillboxes trail, I saw a report on the local news that the government might intervene to address all these potential concerns by closing the trail. Although that would solve some of the misuse problems, it will also prevent all of the enjoyment. Therefore, I urge you to enjoy this Hawaii activity responsibly. Don’t vandalize our Hawaii historical relics. Don’t leave trash. Don’t block the neighborhood roads and driveways by parking anywhere you want. Don’t be a nuisance in to the neighbors. Don’t make unsafe decisions that could lead to you needing a rescue. Some basic good behavior will help ensure that everybody gets to enjoy this Hawaii hike for many years to come. Beyond that, just make sure you bring plenty of water and use your sunscreen. If your timing is right, it will be hot and dry. That means you’re going to be thirsty and exposed to sunlight. There is very little shade, so be prepared. Disclaimer: Stupidity and carelessness can kill you. Use your brain and take responsibility for your own safety. Know the limits of your ability and stay within them. Watch your kids like a hawk. Take this guidance, mix it with your own good judgment, and live to enjoy the rest of your Hawaii vacation!